BOOTS: 1/4 inch heel – no flat soles! = great start to learning! After your intro lessons, arrive at the barn 1/2 hour before class to prep and stay 1/2 hour after to finish up. leave the barn and tack as you want to find it. Weekly lessons are geared to the safe progressive development of the rider. Coaches use the national Rider Level Program which establishes safe, correct and consistent skills at all levels. We offer Rider Testing at the end of the Spring session. Lessons are available in groups, with a maximum of six riders per class with extra coaches and helpers for beginners; semi-private and private instruction. The cost stays the same for every type of class but the length will vary depending on the size of the class. Caledon Equestrian School produces solid, effective and polished riders. We develop skills slowly but consistently. Our riders ride well but become horse people first. Sympathetic communication with our wonderful animals is paramount and that respect is instilled in the students in every riding lesson. During the summer months we offer an intro lesson program for youngsters ages 4 to 6. We show the children how to be safe around the ponies on the ground and build confidence on the pony with a leader and a coach. The Mom or parent, is on site to reinforce instruction for safety. Lessons are offered after 3pm weekdays and regular lesson fees will apply. Practice Rides (Rider 3 and higher): $45/hr. 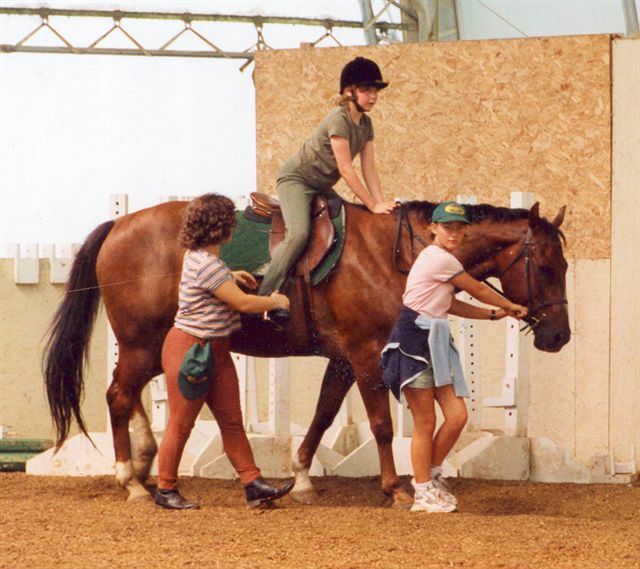 A horse show is held at the end of each session – a minimum $50 show fee will apply. We also offer National Rider Level testing.